Earlier this year, I needed to make stencil for a fun DIY succulent project, and I had no idea where to start. After reading dozens of smart cutting machine reviews online, I ended up biting the bullet and investing in a Cricut Explore Air 2. I’m by no means a crafting expert, but this thing is awesome, y’all. Every time I research, “What can I do with my Cricut?”, I’m blown away by all the new projects I find. One of my all-time favorites is this personalized Cricut doormat. Spoiler Alert: Everyone will be getting monogrammed doormats for Christmas this year. In the meantime, though, I wanted to try my hand at a festive “Hey There, Pumpkin” doormat. I’ve been seeing cute pumpkin-themed doormats all over Instagram, so instead of paying $50+ on Etsy, I decided to put my Cricut Explore Air to good use. Turns out, making a Cricut doormat is pretty darn easy. It takes some patience, which I’ll talk about below, but I can’t see myself paying for a doormat (or personalized anything) ever again. In fact, the next projects on my list are monogrammed Christmas ornaments and a “Merry Christmas, Ya Filthy Animal” doormat, so stay tuned! The question on everyone’s mind is, “How do I make a stencil with my Cricut?” Answer: Cricut Design Space. You can design your own doormat stencil in minutes. 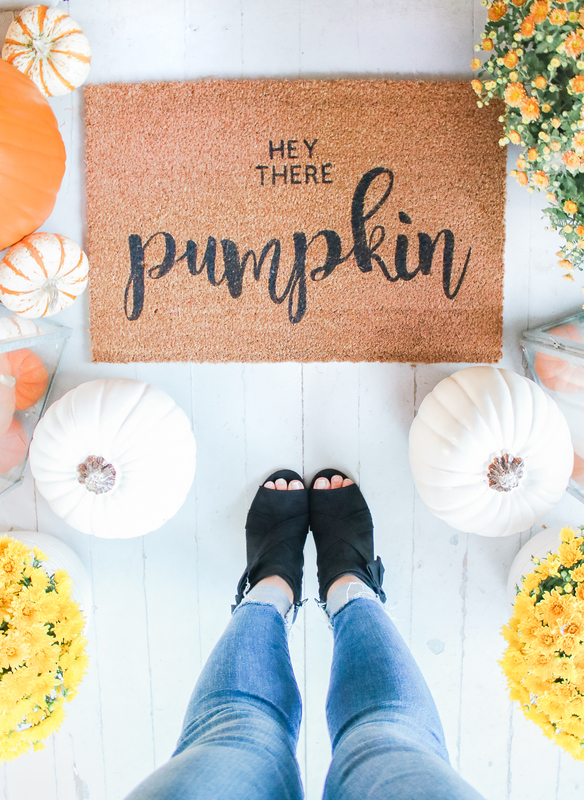 Click here to access the Hey There Pumpkin doormat template I created, and keep in mind that you can customize fonts/size/verbiage to better fit your mat and personal style. Making stencils with the Cricut Explore Air is insanely easy. Just set up the vinyl on your 12×24 cutting mat and click “Make It” in Design Space. The Cricut Explore Air will cut your stencil in seconds. Although they’re not totally necessary, I just picked up some basic Cricut Tools a few weeks ago, and I don’t know how I ever managed without them. The weeding tool is a must-have! Use your weeding tool (or finger nails) to carefully remove any cut vinyl from your stencil. Once your stencil is weeded and ready to go, transfer it to your doormat with contact paper. Use your scraper tool to make the contact paper as flat and bubble-free as possible. This makes the stencil so much easier to peel and position on your mat. Before doing anything else, peel off the back of the vinyl, so the stencil is the only material sticking to the contact paper. Then, position the stencil in the center of the doormat. Gently start unpeeling the contact paper, taping the stencil down firmly with masking tape as you go. Peel slowly and carefully to avoid ripping the vinyl or allowing the vinyl to tangle on itself. Don’t be discouraged if you lose your patience and rip part of the stencil. From experience, you can salvage lots of ripped lettering, and worst case scenario, you can always re-cut the stencil altogether. Next, grab any stray pieces left on the contact paper (like for the “p” in pumpkin, for example) and position them manually on your mat. For a video tutorial of this whole process, click here. This lady is awesome, and I learned how to make stencils with a Cricut from her video. Once your stencil is secured on the doormat, apply some pressure to the letter centers to make sure they stick to the mat while painting. Then, hold the paintbrush vertically and start dabbing on black acrylic paint. It’s very important that you hold the paintbrush straight up and down, otherwise the bristles will reach underneath the stencil, and you’ll get unwanted feathering. Once you’ve painted over the whole stencil, peel it off and use your tweezer tool to carefully remove letter centers. Lastly, grab a smaller paintbrush and make any necessary touch-ups. To weaterproof your Cricut doormat, allow the acrylic paint to dry for 6-8 hours– and preferably overnight. Next, spray on a few coats of polyurethane spray to protect against rain and moisture. Follow the instructions on the bottle in terms of drying time. Once it’s dry, enjoy your new doormat! Here’s a peek at how my Hey There Pumpkin doormat turned out! Like I said, I can’t see myself paying full price for a store-bought doormat ever again. I’m obsessed. If you have a Cricut, what’s the coolest thing you’ve ever made? I’m always looking for new project ideas! Such a clever tool to have!! Your doormat turned out so well – great job!! Thanks, Rebecca! I absolutely LOVE my Cricut! There are *so* many cool things you can make with one.